Kitten Forever are an all-female punk rock band whose minimalist style and DIY aesthetic advertise a certain brutal confidence and confrontationism that is represented on Pressure, their second and latest release on Minnesota’s own Guilt-Ridden Pop independent record label. The band’s anthemic axiom “Do you wanna get loud? Yeah you know you wanna.” aptly initiates the album of 13 poignantly short songs. Listeners needn’t be well-versed in riot grrrl ideology in order to enjoy the listen, since this release strips the genre down to its essential pieces: unabashed femininity, honesty, partying, and punk rock. As far as instrumentation goes, fans who have seen a recent Kitten Forever set have most likely taken in the spectacle that ensues when Liz Elton, Corrie Harrigan and Laura Larson play musical chairs on voice, bass and drums. What results is a dynamic experience that supersedes gimmick-status by virtue of all three women being completely competent at each of these roles. Standout tracks are “Blood Song”, which is perhaps the most accessible song on the album (complete with “ooohs” and hand-claps), and early single “Famous Friends”, which owes as much to Nirvana’s “Molly’s Lips” as it does to anything that the Yeah Yeah Yeah’s Karen O has ever done. Lastly the album’s closer, “Pressure” encapsulates that album nicely with call and response gang vocals that have become a staple of Kitten Forever’s characteristic style. While on the topic of predecessors and influences, anyone who may find themselves saying “I liked it when Bikini Kill did it” should be happy to have an album that doesn’t claim to pioneer an entire movement, opting instead to be abrasive and have fun. These are two areas that Pressure really delivers, but manages to do it without that smell of old sweat and stale PBR that can sometimes come part and parcel with their male counterparts. 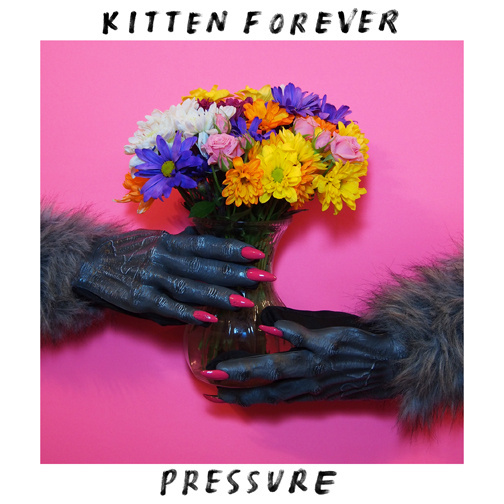 Kitten Forever – Pressure (limited edition double 7” with digital download) can be ordered now or streamed on their bandcamp page, or purchased in person at their release show on Sunday August 4, 2013 with Is/Is and Animal Lover at the Kitty Cat Klub.